28mm Victorian Warfare: Hakuna Matata! My apologies to those of you that now have the somewhat annoying tune from Disney's The Lion King rattling around your head*. 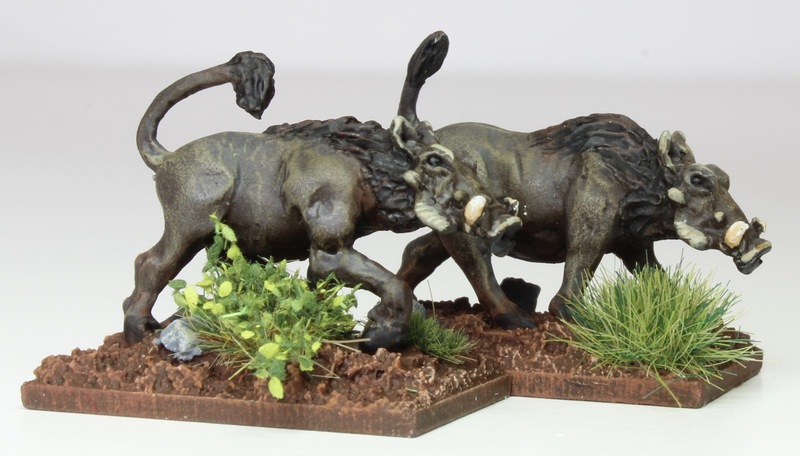 For some reason the phrase just popped into my brain whilst painting a couple of Warthogs from 'North Star Military Figures'. Using the Congo rules, the exploration of the Dangerous Terrain runs the distinct possibility that your intrepid explorers might come across some local fauna and so I went in search of various likely candidates to represent them, if such an occurrence were to happen. *For those not yet aware of said ear worm, I have placed a link for your enjoyment at the bottom of the page. 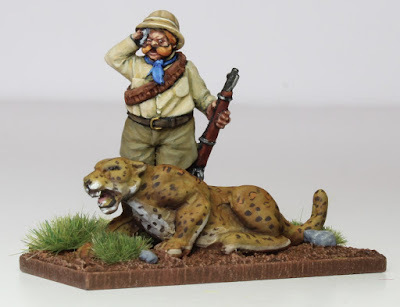 Along with the Warthogs, I needed a Leopard and fortunately North Star came to my rescue again, with a particularly nice sculpt from their Africa range. Looking at the photographs, I don't seem to have managed to get just the right colour for the skin, it appears a little grey. Fortunately it does look a little brighter in the flesh and so I am more than happy to live with it for the time being. Finally a great snake was required. 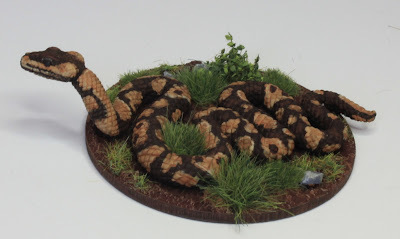 I had considered heading to Poundland again in the hope that they might have some cheap plastic toys that I could use, but I was reminded of the Great Snake that I had painted from 'Otherworld Miniatures'. My first attempt had been painted to represent a South American Anaconda and so wasn't really appropriate for the jungles of the Congo. 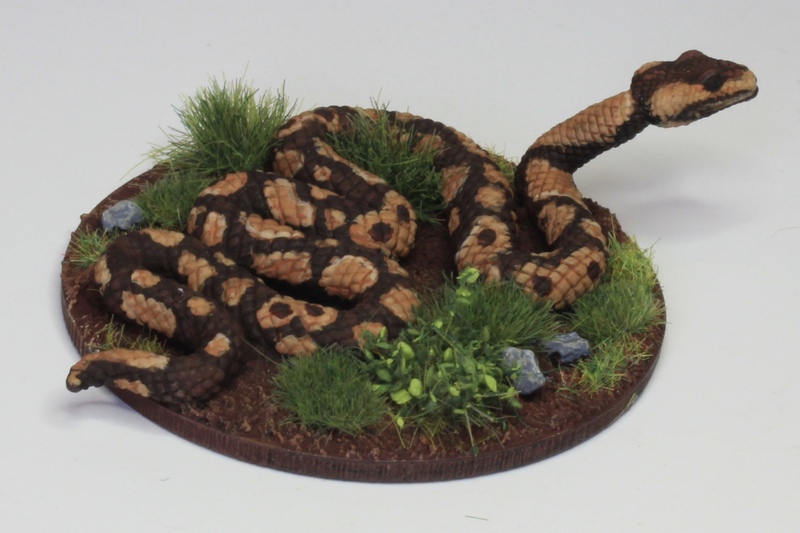 I couldn't bring myself to repaint the original version and so in the end I decided to treat myself to a new model, this time painted to represent the mighty Royal Python, a nonvenomous, constrictor of sub Saharan Africa. Thank you Simon and believe me, I did consider dry brushing the beastie myself! 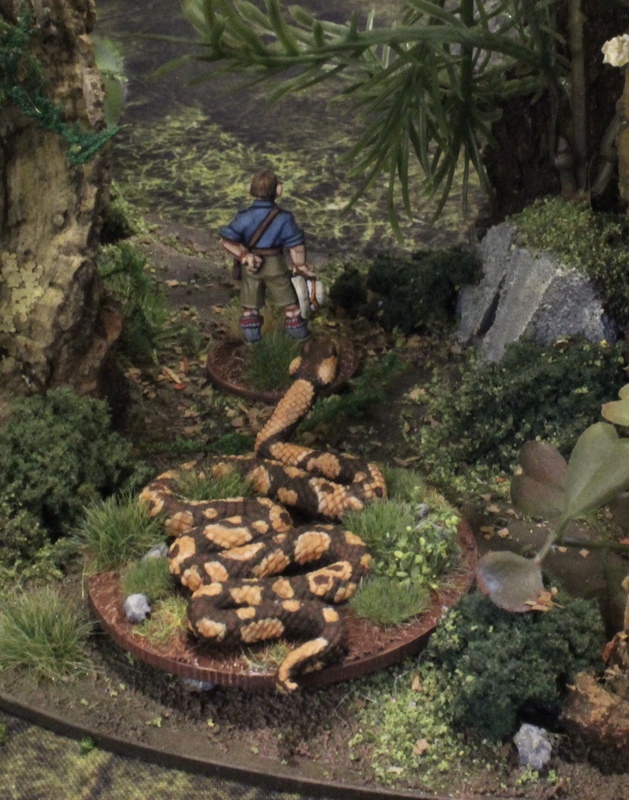 Great work Sir M. Love the snake! I don't need to watch the video. Infact i probably could recite the whole film let alone the song. I must have seen the film well over 400 times!!! Great looking fauna Michael, the markings are truly awesome ! Nice, reminds me I need to get a Leopard. I'm nit sure that you can ever have enough Leopards? Outstanding work. The snake is looking great! Thank you so much Hightower. Everything is superb Michael, but the snake is truly outstanding! tip top brushwork all round sir! So glad that you like him Frank. Fantastic work once again Michael! Nice additions to your collection! Thank you Terry, it is becoming quite menagerie. Thank you, I can certainly understand that feeling though and often find subjects like these take a lot longer than more imagined ones. Even more wonderful stuff! The leopard is awesome, but that snake is just gorgeous. Fantastic work Michael loving the snake. Thank you Stuart, given his price tag I was determined to give him my best shot. Very nice indeed, the snake is exceptional and so is your previous one at an eye watering price as well. I personally am quite taken by the warthogs, can you tell me how you painted the bodies, it looks like a single grey followed by a greeny grey possibly lightly wet brushed over. I have been trying to paint smooth coated animals recently with some very mixed results and any improvement would be good. Thank you John, you are not wrong about the price tag! With regards to painting I had base coated the warthogs then applied some colour with the airbrush - they just happened to around when I was doing something else. I did try to 'paint' the skin, but just couldn't make it work and was getting more and more frustrated. In the end they were given a heavy wash of string tone and dry brushed. I picked out details like the tusks and fur around the skin and that was that. Thanks for the insight. When i dry brush it tends to look a bit chalky and fuzzy, like its a bit out of focus, and at high magnification i can sometimes see individual bristle strokes. That's why i thought you might have used a light wet brush. Your painting is very nice, sir. All of them painted quite good! Snake is most definitely my favorite of the bunch! Thank you Mr. Nimrod, he is my favourite too. Lovely work, Michael. As you're posts have been coming thick and fast, I've not had the opportunity to comment on every one, but it's good to se you've regained your painting mojo after your break. Thank you Jez and not a problem. It also helps being on Easter holiday, at least for a few more days at least. Ooh, I want one of those Boa Constrictors! Wonderfully painted jungle creatures, Michael. The snake particularly impressive! Outstanding pieces once more, Michael! Great stuff, although I am disturbed by the lack of meerkats in a post with this title. They should be simples! Damn you ! I had to endure the Lion King for the entirety of the Xmas holidays in both film, series and floor-play and had ll but put it out my mind. (I had to be Pumba too, just to add further mind numbing insult). Still though your version of Pumba and twin did bring back some happy(ish) memories so thanks for that and it does remind me that I still need to add to my African menagerie. 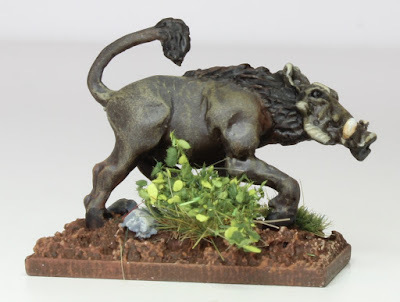 Excellent work on the miniatures Michael. 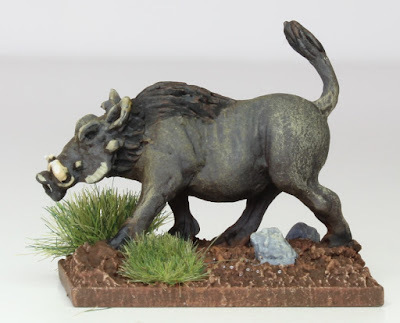 I especially love the subtle ochre hues on the warthog's grey hide. I'm in awe, your paintjob on these animals looks very natural and realistic. You got these skin- and furtones exactly right. Well done!